Harvesting your cannabis the reaping of the bounty, and is the most enjoyable time you will spend with your garden. Cannabis Plants are harvested when the flowers are ripe. Generally, ripeness is defined as when the white pistils start to turn brown, orange, etc. and start to withdraw back into the false seed pod. The seed pods swell with resins usually reserved for seed production, and we have ripe sinse buds with red and golden hairs. Most new cannabis growers want to pick early, because they are impatient. That is OK! Just take buds from the middle of the plant or the top. Allow the rest of the cannabis plant to keep maturing. Often, the tops of the plants will be ripe first. Harvest them and let the rest of the plant continue to ripen. You will notice the lower buds getting bigger and fuzzier as they come into full maturity. With more light available to the bottom portion of the plant now, the plant yields more this way over time, than taking a single harvest. Do not harvest too late! It is easy to be too careful and harvest late enough potency has declined. Watch the plants and learn to spot peak floral potency. 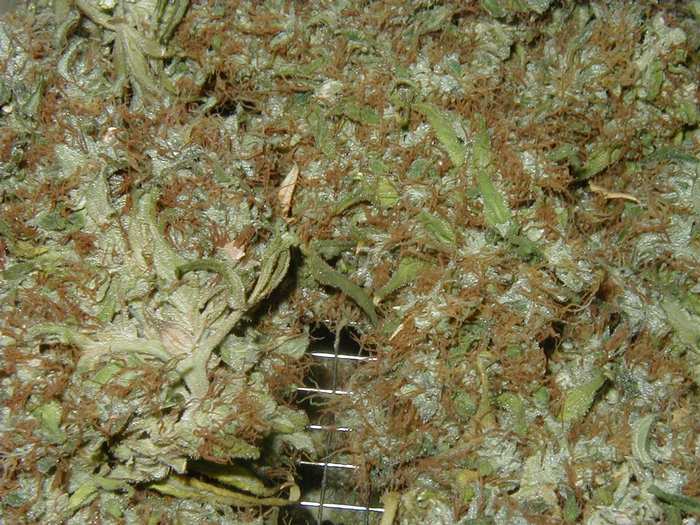 Dry cannabis buds until the stems are brittle enough to snap, then cure them in a sealed tupperware container , burping air and turning the buds daily for two weeks. Once experienced cannbais grower told me to dry in an uninsulated area of the house (like the garage) so that the temperature will rise and fall each night, as the plant is drying. If you treat the plant as if it were still alive, it will use some of it is chlorophyll while it is drying, and the smoke will be less harsh.